This morning, led by our candidate, Steve Williams the local action team was joined by activists from across the area, with people coming from Merseyside, Widnes, Wirral South, Wirral West and Birkenhead to deliver over 4,700 letters and leaflets right across the Moreton West and Saughall Massie Ward. In a little over two hours everyone had completed their allocation and the job was done. Thanks to all our ‘usual suspects’ for coming out this morning, and special thanks to Carl Cross, Roger Bates, David Elderton, Geoffrey Watt, John Gilbert, Alan Guy and Les and Barbara Thomas for their support as well. I was out with colleagues on the Lingham Estate, and guess what……… for the first time in years New Labour were distributing a leaflet called ‘Labour Lies News’. Tell me, is there an election taking place? Strangely the Labour Lies leaflet refers to the Labour candidate as living ‘all his life in Moreton’…. Why then is the address on his nomination papers given as Flat 3, 4 Queens Road, Birkenhead CH42 1QY? Now my geography ain’t brilliant, but even I know that Birkenhead is not Moreton. Perhaps the Labour agent would like to respond? At noon today nominations closed for the by-election in Moreton West and Saughall Massie on Thursday 26th November. The by-election has been caused by the sad and tragic loss of our colleague, Suzanne Moseley 47. Five candidates have been declared to contest the election with the Local Conservatives taking on four ‘Left Wing’ candidates, none of whom live in the ward, living as far away as Birkenhead, Upton, Hoylake and Seacombe. Our candidate, Steve Williams does live in the ward and has lived in the Moreton area all of his life. Because he lives in the community, the issues that affect you, affect him as well. No doubt over the next four weeks you will start to hear from some, or perhaps all of the candidates. Just ask yourself where they have been for the last god knows how many years . Remember the local Conservatives work all year round, not just at election time. So on Thursday 26th November vote for Steve Williams, he will continue the good work that me, Simon, and until her tragic death Suzanne have done for the last 6 years. Earlier this afternoon I met with Joe Smith, Highways Engineer to look at various problem areas in Moreton. First we looked at the ‘One Way’ signage in Barnston Lane, close to the junction with Netherton Road. The signage is all there, however some of it needs tidying up, Joe has also agreed to install ‘Directional Arrow Road Markings’ in Netherton Road and Barnston Lane, hopefully this will solve the problem of traffic going the wrong way. Second we looked at suitable locations for a solar powered vehicle activated speed warning sign in Borrowdale/Overchurch Road. 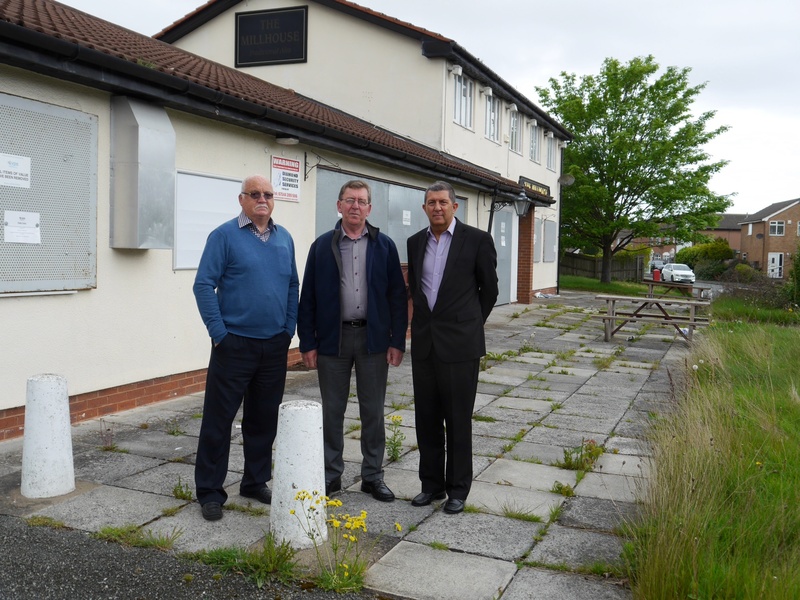 After some debate about potential problems, we agreed to install a device on Borrowdale Road, close to the junction with Burrel Drive for a trial period to see what residents think. IF there are no problems it will remain permanently. Third we looked in Bermuda Road to see if there was a suitable location for another speed indicator device, sadly because of the proximity of the houses there was not a suitable location. However Joe has agreed to provide some ‘Slow Markings’ on the road painted in red. Hopefully that will help. Finally, as there was not a suitable location in Bermuda Road, it has been agreed to reinstall the speed indicator device, permanently, on Upton Road, close to the junction with Paulsfield Drive. That will be £28,000 please. Thats what senior officers of the Council are asking the Cabinet to approve! You can read the cabinet report by clicking HERE. Seems the ruling Labour / Lib Dem administration are happy to slash our school crossing patrols, transfer our community centres, threaten to close our libraries, leisure centres and swimming pools, but then find £28,000 to send, as yet an unknown amount of Council officers to the World Expo in Shanghai next year. Whats the betting that the Cabinet approves it? TIME FOR CHANGE! Readers of the blog, and the wider Moreton community will be aware that the Royal Taste takeaway in Pasture Road, has applied on four occasions to Wirral’s Planning Department for longer hours, each time local residents and the police have objected, and each time the planning committee has said no. After the last refusal the Royal Taste appealed to the Planning Inspectorate. I am delighted to tell you that I have been notified today that the appeal has been dismissed. I am beginning to wonder what part of NO the Royal Taste does not understand! Another Night on the Knocker! I know its repetitive but, tonight we had two teams out seeking peoples views in Moreton. As well as the ‘usual suspects’ we were joined by John (Indiana) Bebell, Lizzie Lumley and Don McCubbin who came over from Wirral West to help. Thanks guys. Again people expressed their sympathy for the loss of Suzanne, and many said they would be voting for Steve Williams, our candidate on the 26th November. A few issues were raised and me, Steve and Simon will be on to them over the next few days. Thanks to everyone who opened ther doors to us. The team will be out again tomorrow, look out for us in your road. About three weeks ago, our areas ‘You Decide’ panel agreed with me that we should spend £10,000, on two vehicle activated signs that warns motorists to slow down. I suggested that one be fitted somewhere on Borrowdale/Overchurch Road and the other on Bermuda Road. I will be meeting with highways engineers in the next few days to determine where the best locations may be. I have also asked them to look at the ‘One Way’ signage on Barnston Lane, particularly with regard to traffic coming out of Netherton Road and the Coll Trader car park. Watch this space for further updates.